Dental Veneers Exeter: Veneers offer a simple way of enhancing your smile by concealing the colour, shape or position of the natural teeth. Often restoring just one tooth in this way can make all the difference. Veneers are an art form, using the latest materials to create a natural-looking, colour-matched result. When prescribed by a skilled clinician, using a skilled technician, the result can be so close to the natural tooth, it can be hard to tell which is real and which is the veneer. Many patients whiten their teeth before having veneers. Patients tend to want minor changes to their teeth, but worry about having them cut down to points. Veneers represent a minimally invasive procedure – very little tooth surface needs to be taken away and, in some cases, none at all. 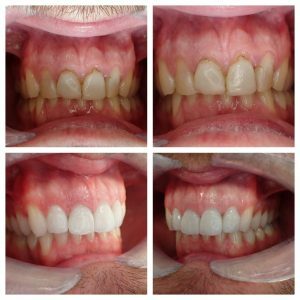 Align, bleach and bonding can produce equally stunning results without the need to veneer the tooth. Hence less damaging and cheaper. Patients are referred to our cosmetic technician to take a professional shade, which is done at a particular time of the day to avoid, for example, the afternoon darkness giving a false impression of tooth colour. The shade can be whitened, if necessary, to your satisfaction. We can construct a wax mock-up of the Veneer for you to try and give you an idea of the finished look. Once you’re happy, we can go ahead and have the Veneer made, ensuring your expectations are being met.